LSU football is 3-2 after losing at home to Troy, 24-21. The Tigers snapped their 49-game non-conference home winning streak with the defeat, and now they get to run a gauntlet of SEC opponents. Canning head coach Ed Orgeron might be consolation for this dismal start, but it would be quite expensive. It slips to $8.5 million in 2018, $6 million in 2019, $4.5 million in 2020 and just $1 million for the final year. Athletic directors say coaches and agents have been able to negotiate incredible buyouts by in turn giving back buyout clauses should they leave for another job before the end of the contract. While those tend to get paid by the program luring them away, at least the school gets something. It’s particularly important at mid-level programs where good coaches naturally get poached. In Orgeron’s case, if he were to leave LSU before Nov. 28 of this year, he’d owe the school $3.5 million. It drops to $3 million next year, $2.5 million in 2019, $1.5 million in 2020 and $500,000 in 2021. But Orgeron isn’t some hot, fresh-faced coach who knows how to dab and woo recruits. He’s a guy who went 10-25 in three seasons at Ole Miss and turned in one okay year at USC. He’s a known entity. But he, somehow, convinced LSU to guarantee him $12 million in case of turmoil. 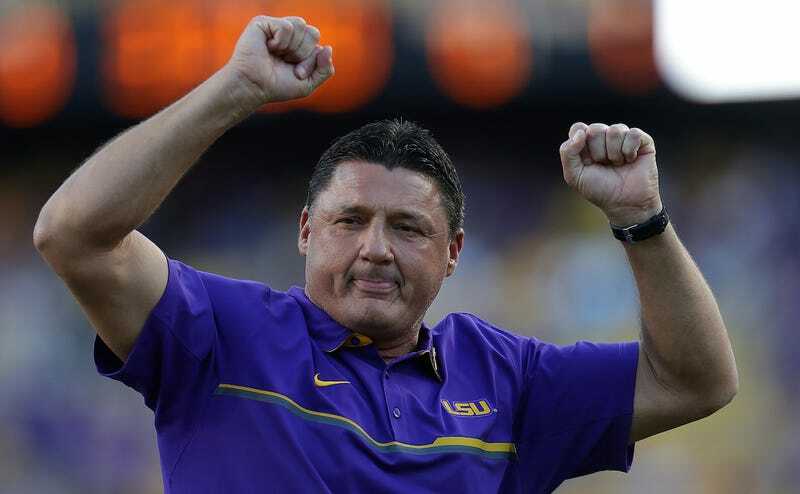 Credit to Orgeron for getting a fantastic deal, and no pity for the school that was stupid enough to agree to it. Can You Make Out Anything Crazy Ed Orgeron Says In This Fiery Pregame Speech?